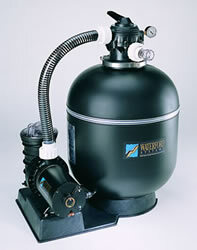 These rugged high-performance sand filter systems will deliver years of trouble-free operation. Sta-Rite, known for manufacturing top quality in-ground pool equipment, has brought its technology to its above-ground line – delivering superior flow rates, energy-efficient operation, and unsurpassed reliability. The Standard Equipment Package is available two different sized systems: an 18" tank with 1-hp pump (for pools up to 24' round) and a 21" tank with 1-1/2 hp pump (for pools over 24' round). Both systems come complete with base, multi-port valve, and hose connections. 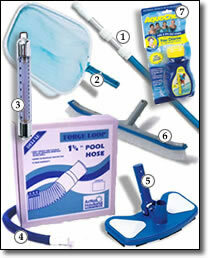 Put Sta-Rite's advanced technology to work on your pool this summer. This rugged step/ladder entry system is all you need to enter and exit your pool if you don't have a deck. The Easy Pool Step system features our rugged step that will fit any pool up to 54" deep; and makes getting out of your pool easy and safe. Attached to the step is our classic ladder that swings up and can be locked for safety. Both the Easy Pool Step and the classic ladder can support up tO a 300-lb. swimmer. 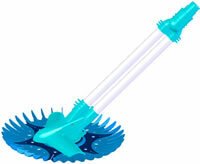 They are made of corrosion-proof polyethylene for years and years of use. The step and ladder system is easy to install and operate.The step and ladder entry system is backed by a 3-Year Warranty .